US Pharmaceutical company, 710 Pharmaceuticals MNE, have released ‘Billy’s Bud”: a CBD oil named after Billy Caldwell, the hero Irish boy who’s battle with severe epilepsy using cannabis has captured the world’s imagination. Charlotte Caldwell, Billy’s mother, has claimed her son is only alive due to his access to medicinal cannabis. Billy was suffering up to 100 seizures a day due to his status epilepsy, a severe form of epilepsy which means he is unable to come out of seizures by himself. Speaking to The Independent, Charlotte said her family was “crying happy tears” over his “incredible” progress. “I just feel absolutely over the moon that at last, we can announce some good news, it’s been a real struggle for us. 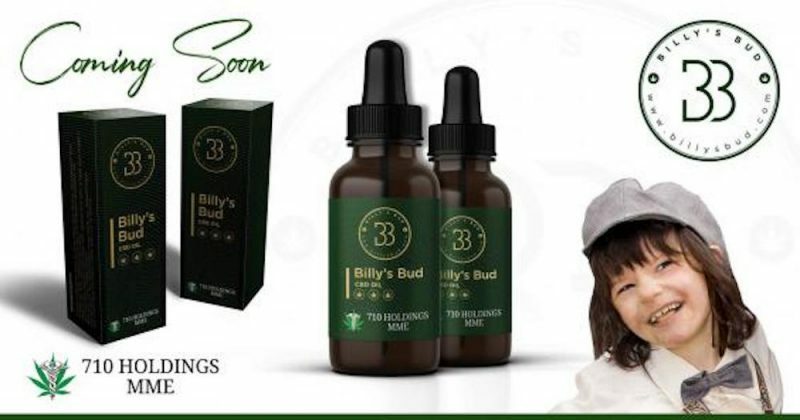 While Billy’s Bud is a CBD only product it will be sold legally in the UK. Billy himself currently takes two types of cannabis oil; one containing CBD, the other made from the THC, which is illegal in the UK due to its psychoactive effects. Sativex, made by GW Pharmaceuticals, is currently the only legal full spectrum cannabis-based medicine in the UK. Billy made history earlier this year when he became the first patient to be prescribed cannabis oil on the NHS. This victory came after a lengthy battle for Charlotte and her son. The family were forced to America in June 2016, to visit a specialist epilepsy centre in Los Angeles, where doctors found a lesion on the left temporal lobe of Billy’s brain. Due to its positioning, doctors were unable to operate without causing catastrophic damage to his speech and memory. Instead, the Co Tyrone hero was referred to a medical cannabis specialist. Charlotte was forced to take regular trips to the States where doctors would give the boy cannabis oil to help stop his seizures, which could reach up to 100 a day. When Charlotte’s supply of the oil nearly ran out and was unable to afford any more trips to the US, she took hi, to the local GP. Dr Brendan O’Hare looked at the success cannabis oil was having on Billy, and prescribed the CBD oil, making history. While Dr O’Hare said that he did not want to set a precedent with his prescription, he realised that he had to do what was right: “Whatever the rights and wrongs, we had a child who had benefitted and the child’s welfare was paramount. On that basis, I issued a prescription. The cannabis oil seems to have worked true wonders on Billy, not just his epilepsy, but also on his autism, which Ms Caldwell said has also improved under the use of the oil. Speaking to The Independent she said, “His eye contact has got really good, he used to have to wear special needs boots to support his ankles, but now he is wearing trainers. Story’s such as Billy’s illustrate the increasing need to research the medicinal potential of cannabis. Due to cannabis’ Class B and Schedule I status, research is cripplingly limited. 600,000 people are affected by epilepsy in the UK. 600,000 people could potentially benefit from legalising cannabis for medicinal purposes. Is it time to take this step in the UK? are different mixtures suitable for different illnesses or is it all the same ?